Join in the effort to make homelessness RARE, BRIEF and NON-RECURRING. Composed of local non-profit agencies, housing providers, municipalities, churches, government agencies, and county residents, DCHC works collaboratively with the Denton County Homeless Leadership Team and our CoC lead, the Balance of State operated by the Texas Homeless Network in assisting persons who are homeless and potentially homeless to achieve self-sufficiency and gain affordable housing. It’s simple to get involved. Donate. 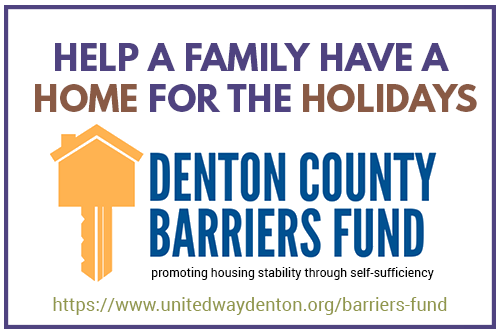 The Denton County Barriers Fund offers funding that is the most efficient and least costly solution to ending a person’s homelessness. Join. To join the coalition, complete the DCHC Membership Application and return it. Attend meetings. DCHC Steering Meetings are the last Wednesday of the month and the General Body meets quarterly on the first Wednesday. All meetings are open to guests. Listen, Learn and Act. Help plan and coordinate the housing and services for families and individuals experiencing or at risk of homelessness. Volunteer for the PIT Count! Modeling the MDHA Flex Fund, the Denton County Barriers Fund answers a simple question, “what solutions will best match the needs of this person or household and will end their homelessness quickly and permanently?” Most people face unique barriers that prevent them from self-resolving their housing crisis. In Denton County these have included access to critical documents (photo identifications, birth certificates, social security cards, documentation of homelessness), security deposits, transportation (bus passes or car repair) to be able to get to a job, job-related expenses (tools, uniforms, boots, certification, licensing), and basic furniture or household items. In addition, these minor but impactful expenses may not be covered through existing federal, state and local grant funds. The fund is intended as a ‘fund of last resort’, and is meant to be accessed when no other funding or resources are available in the community to ensure housing stability for people experiencing or at-risk of homelessness. Clients served must be enrolled in a program or participating in active case management, and the maximum award is $800 per family. Case managers are required to document the need for the funds, how they will help the client self-resolve, and why the need cannot be funded through other available resources. The power of flexible dollars in the Barriers Fund, even in the smallest amount, can make a big difference while preventing more difficult and costly situations. In just one year, the Barriers Fund has assisted with housing stability for 14 clients all for less than $6,000. The Barrier Fund helped a domestic violence victim and her 5 children with the security deposit and first months rent to move into a new apartment away from their abuser. The Barrier Fund helped a person who does not have a vehicle with a $650 annual local day bus pass to get to and from work. The Barrier Fund helped reduce the monthly rent by $14 a month on an apartment unit so a client would be eligible for program assistance for 6 months giving him time to work to increase his income and remain stably housed. The Barrier Fund helped a veteran pay a $510 past due utility fee, the last barrier standing between him and long-term housing stability. The Barrier Fund helped a domestic violence victim needing assistance with paying for repair shocks for her vehicle. The client saved enough to pay for the parts and the barriers fund was able to help pay for the labor. There are more families like these who could use a little hand up. Give Now and Help a Family have a Home for the Holidays.